An equipment bag drifts away from spacewalker Heide Stefanyshyn-Piper as she works on a solar array gear during a Nov.18, 2008 spacewalk outside the International Space Station. A tool baglost by a spacewalking astronaut last year met its fiery demise in Earth?satmosphere Monday after months circling ever closer to the planet. The$100,000 tool bag plunged toward Earth and burned up as it re-entered theatmosphere, according to the U.S. Air Force?s Joint Space Operations Centertracking it and more than 19,000 other pieces of space junk in orbit today fromVandenberg Air Force Base in California. ?Based onits size and composition, we expect the object to completelyburn up before hitting the Earth,? center officials said in a statement. 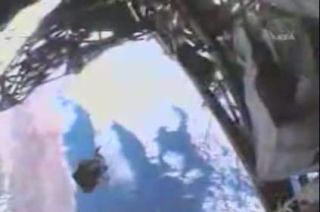 The toolbag was lost during a Nov. 18 spacewalk at the International Space Station. Inaddition to the Joint Operations Space Center, amateur skywatchersalso tracked the bag as it silently circled the Earth. Center officialsdid not immediately have a specific time and location for the tool bag?sultimate demise, but a Sunday report by the Web site Universe Todaypredicted the wayward space satchel would hit the Earth?s atmosphere at about9:16 a.m. EDT (1316 GMT) over the Pacific Ocean, just west of Mexico. The toolbag weighed about 30 pounds (14 kg) and was about the size of a small backpack.It contained grease guns, trash bags and a scraper tool. Former NASAastronaut Heidemarie Stefanyshyn-Piper lostthe bag during a November spacewalk to repair a balky solar array joint onthe International Space Station as part of NASA?s STS-126 shuttle mission. Agrease gun leaked inside the bag, which apparently wasn?t secured properly, andit drifted free while Stefanyshyn-Piper was trying to clean up the mess. "Therewas that split second thinking that, maybe I can go jump for it and grab it.Then I realized that it would just make everything worse and then we'd have twofloating objects, one of which would be me," Stefanyshyn-Piper said in atelevised Nov. 19 interview from space the day after losing the bag. "Sothe best thing to do was just to let it go." Stefanyshyn-Piper,an active captain in the U.S. Navy, retired from NASA?s astronaut corps lastmonth to return to her Navy duties. Spacedebris, in general, has been a growing concern for NASA and otherspaceflight operators due to the unprecedented crash of a Russian and Americansatellite earlier this year. The Feb. 10 smashup in space created two new largeclouds of debris that have been continuously tracked by the Department ofDefense?s Space Surveillance Network. The networkis currently tracking more than 19,000 pieces of space junk larger than fourinches (10 cm) across, but an estimated 300,000 total objects bigger than ahalf-inch (1 cm) are thought to be in Earth orbit today, space debris officialshave said. Stefanyshyn-Piper?sbag and other tools lost by astronauts in the past have typically posed littlerisk of coming back and hitting spacecraft in orbit. The tool bag, for example,circled Earth for more than eight months before finally destroying itself inEarth?s atmosphere. If a pieceof space debris is expected to come close to satellites or manned spacecraftlike NASA?s shuttles or the International Space Station, the vehicles can bemoved ahead of time given enough advanced notice. The spacestation?s most recent brush with a piece of space junk came on July 17, justhours after the space shuttle Endeavour arrived with a crew of seven astronautsduring NASA?s STS-127 mission. Astronauts fired Endeavour's thrusters tonudge the space station and move it clear of a piece of orbital debris thatwould have come within its safety perimeter, NASA officials said. Endeavour?sseven-astronaut crew landed in Florida Friday to end a successful 16-daymission that replaced a member of the station?s crew, as well as delivered a newexperiment porch and spare parts for the orbiting laboratory.